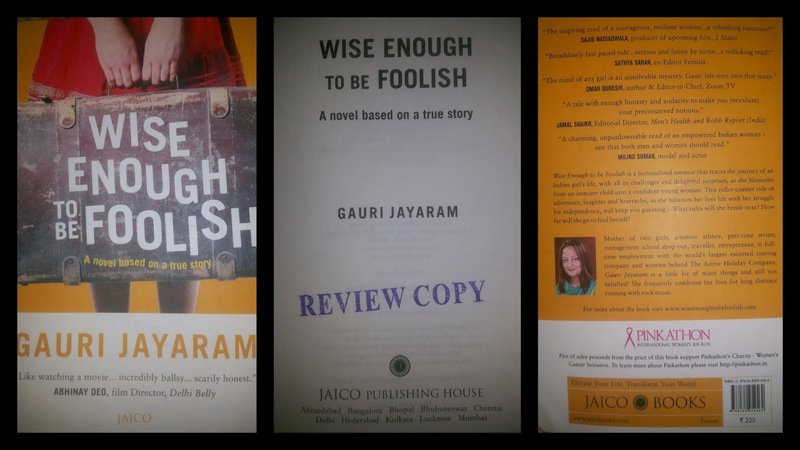 Wise Enough to be Foolish is a fictionalized memoir that traces the journey of an Indian girls life, with all its challenges and delightful surprises, as she blossoms from an insecure child into a confident young woman. This roller-coaster ride of adventure, laughter and heartache, as she balances her love life with her struggle for independence, will keep you guessing what rules will she break next? How far will she go to find herself? Mother of two girls, amateur athlete, part-time writer, management school drop-out, traveler, entrepreneur, in full-time employment with the world’s largest escorted touring company and woman behind The Active Holiday Company, Gauri Jayaram is a little bit of many things and still not satisfied! She frequently combines her love for long distance running with rock music. Gauri, the protagonist. She is bold, independent and a rebel. She is flamboyant and a good student who learns the lessons of life. She takes life as it comes and always strives hard to move on. All other characters like her parents, siblings, Nicky, Riya, Suraj, Zaid, Shiv, Uday and many-many others comes into the picture with the sole purpose of letting Gauri learn and unlearn the lessons that life teaches her. After all, the book is nothing but a (auto)biography of Gauri, the author herself! The cover-page of the book is interesting. It is well-thought out and gives you an idea of what can be expected – A few pages from a girl’s life! The story spans from the birth to the first twenty-eight years of the protagonist, Gauri. It is almost like a memoir. It is a feel-good book because I bet that there will be a smile in your face when you complete the book. The narrative is lucid and very descriptive. I also observed that when the writer has captured the thought-flow of a child to a teenager to an adult’s beautifully. I felt as if the writer also grows up and evolves with Gauri. The book is motivating and empowering as well. It throws light on the sad fact that gender based discrimination still exists in families regardless of how educated and socially forward they are! I appreciate the fact that the author, in her own subtle way, mentioned about child molestation and public molestation in our capital city – New Delhi. She has emphasized on the fact that nobody can choose their parents, gender, religion or economic status. These are some factors with which we are born with and discrimination on this basis are pointless; shameful rather. I liked her take on Hinduism – How it is male dominated and how badly women are treated. There is an entire paragraph on the same and it was thought provoking. I really started enjoying the book when Suraj comes into her life. It suddenly becomes interesting and complicated. The book oozes with optimism and hope. It is nothing but the transformation of a girl to woman to a lady! The book blurb is concise and I wish it was more descriptive. After all, I saw a lot of sentences which could have been quoted. It would help in attracting readers towards the book! The first fifty pages of the book seemed like the random scribbling from a kid’s/young-adult’s personal journal. It is very descriptive and seems to go on forever. It might make the reader wonder why I should read this; why I should know this. In the process of explaining boyfriends, break-ups and exes, the story loses its track of delivering what was promised. It could have been so much. But it chose to elaborate about attempts to find Mr.Love! This may be slow and descriptive. It could even bore you at times. But, it will leave you with positivity. In short, read it if you have patience! Jaico Publishers for giving away the book!